Hello and welcome to Episode #14, the first interview in the extended season of the Mother’s Quest Podcast. Starting with today’s interview of Amanda Steinberg, I’m excited to bring you six more episodes to light our way to an E.P.I.C. life. I reached out to Amanda because I am ready to re-write my money story and she was uniquely qualified to guide me. Amanda is the Founder and CEO of DailyWorth.com and just published a book titled “WORTH IT: Your Life, Your Money, Your Terms”. This past summer, Amanda was chosen as one of Oprah Winfrey’s SuperSoul 100 and recently was named to Fast Company’s Most Creative People in Business – all for good reason: she has revolutionized the relationship between women and their finances. Amanda empowers women to explore the equation between their self-worth and their net-worth and to resist the conventions that keep us from viewing money as a source of personal power. In our interview, with her new book as a back-drop, Amanda shares candidly about the ways her mother shaped her relationship with money, how after a divorce she re-built her life and re-wrote her money story when she found herself in debt and under the weight of a mortgage she couldn’t sustain, and how founding the Daily Worth and now Worth FM is breaking the mold by bringing information and resources about money to women in unique ways. Amanda and I talk candidly about how her book, and a spreadsheet she shared in her Facebook group, inspired me to sit down with my husband, for the first time in our 20 year marriage, to understand our finances and determine our net worth, the number Amanda talks about as mattering most. Amanda’s honesty, humor and ability to make a conversation about money and investing in ourselves accessible has already shifted my life. 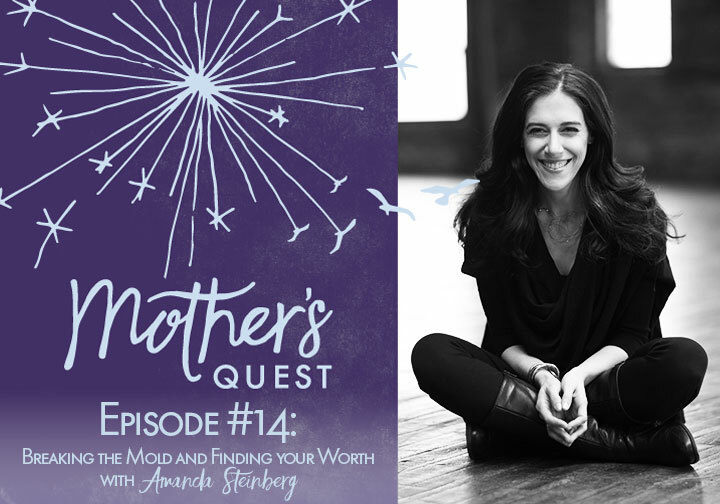 I hope you too will be inspired by Amanda to break your own molds, find your worth, and re-define your relationship with money. Redefining women’s relationship with money through a metaphor of roots and wings. The importance of taking risks and how the “cost” of taking a risk may actually be lower than the cost of not. This article referencing the Harvard study which outlined that love and household chores are among the most important things to provide your children for their success. DailyWorth – Helping women earn more, save more, and spend smarter. The DailyWorth Newsletter – sign up here. WORTH IT: Your Life, Your Money, Your Terms by Amanda Steinberg. Worth It Facebook Group you can join after purchase of the book. MoneyType™ Assessment – Reveals your unique perspective when it comes to money. Your MoneyType™ Report will give you insights into how you think about and manage money. WorthFM – a savings and investment platform designed to guide you step-by-step. One Light Global – An organization that helps create global peace through providing direct humanitarian aid to people in crisis, assisting them in establishing successful new lives, helping them heal from the devastation of war and trauma, and establishing platforms for peace and collaboration between groups in conflict. Much gratitude for everyone who spread the news of my extended season to help reach more moms with these conversations by supporting the ThunderClap Campaign. I invite you to schedule a free 15 minute planning session where I can help you bring more intention to your life using the Live Your E.P.I.C. Life Planning and Reflection Sheets which you can download for FREE at www.mothersquest.com/reflectionsheets.